"Brand New List Building System Shows You Exactly How To Build A List That Will Throw Their Money At You Over and Over Again!" The "List Builder Mentor System" is an all in ONE system for anyone wanting to build a list quickly and easily! From start to finish you'll learn to build a profitable list! Profit with your list over and over again! Do it all on autopilot! The biggest mistake I made as an Internet marketer was not focusing on building my list. I heard so many marketers claiming that "the profits were in your list". I didn't believe them and it cost me months of not making any money and lots of frustration. Even when I did start to build my list, I was totally lost. I didn't know where to start and it seemed that anything I did just wasn't working. I had everything in place, but just couldn't "connect the dots". Now that I have successfully built my own profitable list, I've taken every successful step that I have used and have complied it into an easy to follow list building course that will teach you how to quickly and easily build a list that you can sell products to and make profits anytime you want. I'll show you exactly what you need to do to start your own newsletter. From building a website all the way to creating bonus products to give to people for subscribing. You'll also get a super smart piece of software that will allow you to create an unlimited number of HTML newsletter issues quickly and easily with no HTML knowledge needed. Autoresponders are the life blood of any newsletter. They allow you to reach your subscribers in an automatic way. In the List Builder Mentor System, I'll tell you about free autorsponders you can use, and which are the best paid autoresponders to use. This will save you a lot of money and keep you from making the mistakes I made with autoresponders. You'll also get a video series that teaches you exactly how to use an autoresponder. I'll also tell you what messages you need to put into your autoresponder so that you can make money off of ALL of your subscribers over and over again. The "List Builder Mentor System" also comes with a years worth of messages that you can add your information to and plug in to any autoresponder right away. This makes it just too easy for you, but very profitable. The "List Builder Mentor System" will also teach you several powerful tips and techniques that will show you how to drive traffic to your newsletter signup page. The hardest part of building a list is getting people to subscribe. I know that, you know that, and so do the big gurus, but they always fail to teach you how to get people to sign up for your newsletter. In this course the secrets to finally getting targeted subscribers is finally revealed. I hold nothing back here, and give all of my techniques for getting subscribers. I also include 18 step-by-step videos that will show you exactly how to boost the amount subscribers you get every day for free, and starting immediately. 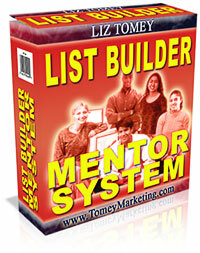 The "List Builder Mentor System" covers it all. From start to finish you can finally get a profitable newsletter set up and going in a short amount of time. Having your own list is like having an ATM machine that you can walk up to at any time and withdraw money from. If you're ready to learn exactly what you need to do to start building a list that will make you money over and over again, then get your hands on the "List Builder Mentor System" right now! WAIT! Special offer: Would you like to have resell rights to the "List Builder Mentor System"? You'll be able to sell the "List Builder Mentor System" to your customers and keep 100% of the profits. Your resale rights come with a complete website salesletter, and professional graphics for you to promote the "List Builder Mentor System" with. You'll have your own product that you can sell to YOUR customers and keep all the profits! There is no additional charge for the resale rights.